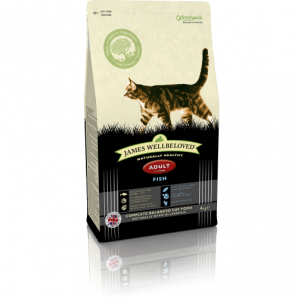 James Wellbeloved - Fish & Rice Adult Cat - perfect for fully grown, average weight, active cats. The Adult variety is perfect for fully grown, average weight, active cats. All the nourishment required for a healthy life in peak condition. A complete and balanced food with all the vitamins and minerals your cat needs. The same delicious taste, right across the range. Ocean White Fish & Rice comes in 3 varieties: Kitten, Adult and Senior/Light. All have the same delicious taste. So you avoid the health and taste problems of changing brands at the different stages of your cat's life. Ingredients: White rice (min 26%), white fish meal (min 25%), prairie meal, olive oil, potato protein (min 9%), vegetable, fish oil,tomato, chicory extract, carrot, cranberry extract (min 0.05%), DL methionine, lysine hydrochloride, taurine, threonine, zinc methionate, yucca extract, rosemary oil. vitamin A 25,000; vitamin D3 1500; vitamin E (alpha-tocopherol acetate) 200. Copper (cupric sulphate) 15mg per kg. Contains vitamins C and E as mixed tocopherol antioxidants.